Since we are featuring Kincaid's Hope on the blog this week, I thought I would treat my readers to an excerpt of Grace Greene's wonderful writing. 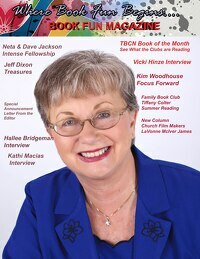 After you read, be sure to go to http://adf.ly/67LDk and enter to win this book. One winner will be selected at random on Saturday evening. She’d built her life before; she could do it again. Beth Kincaid had awakened before dawn, but the memory of yesterday, of being fired, was a dark, gnarly place in her brain. She pulled the goose down pillow over her head hoping to slip back into sweet oblivion. She kicked off the covers. She was an early riser and always had been. Apparently, that didn’t change with the circumstances. First, a hot shower, pounding and steaming, a brisk blow-dry of the hair and then a little makeup‒a swish of the hand towel to shine up the faucet completed the morning routine. Beth shook out her folded jeans and held them up to her waist. She hadn’t seen them in a long time. She sorted through the shirts hanging in the closet, bypassing the silk shells and dressier button-downs, opting for a sky blue cotton shirt with pearl buttons. Next, coffee, but there was no rush. She wouldn’t be among the DC beltway commuters this morning. On the counter separating the kitchen from the living room, the answering machine splashed its blinking red light onto the wall‒the same as it had last night when she came home. She turned her back to it and concentrated on getting the coffee maker working. Soft strains of Mendelssohn’s Wedding March came from nearby. Beth jumped, startled, and coffee grounds scattered across the countertop. Stephen‒she’d called him yesterday, but he’d asked all the wrong questions. She found her purse and dug the cell phone out of the side pocket. “I didn’t feel like talking.” She sniffled and was embarrassed that she couldn’t help it. She cringed. Stephen’s mind was always on money these days. His investments had tanked and she sympathized, but…. Her finger hit the End button without consulting her good manners. Beth clutched the phone. She could see him‒almost as if he were right in front of her‒his dark eyes, almost black, so concerned, so sincere. He’d stopped asking her to take a loan against her 401K, but since yesterday it was severance, severance, severance. If he said that word one more time, she’d scream. When the Wedding March began playing again, she stuffed the phone under the chair cushion. He didn’t understand. No one could. But that wasn’t true. Maude always encouraged and supported her. Maude Henry, no relation and under no obligation, had rescued Beth and her brother, Daniel. She’d done her best to help them‒two troubled children with no one to protect them. Years later, just before Beth left town, Maude had given her a book. Beth stopped in front of the bookcase and ran her fingers along the spines of the books. There it was‒Clarissa’s Folly. She slid it from its spot on the shelf. The dust jacket was gaudy and melodramatic, an illustration of a young woman in a long, full-skirted dress standing in front of a gray stone house and clutching a red cape about her, against the wind. In the background, a man stood near the corner of the house watching her. Tall and slim, dressed in black, his face was shadowed below the brim of a tall hat. The jacket branded it a gothic romance, decades out of fashion and a misfit among her other books. Almost an embarrassment. She’d considered discarding it many times, or, at least ripping off the dust jacket. Why hadn’t she? Because of Maude. She didn’t have the heart‒or the lack of heart‒to throw it away. Make your own life. Don’t let it be made for you. Beth appreciated the advice, but had always been bemused by the choice of book. A photo stuck out from between the pages. She brushed the edge gently with her fingers, then pulled it out. Michael. Dark hair, blue eyes and a smile that set her tingling from head to toe. Back then, of course. Not now. Not in a long time. They’d been so young then. Only a decade ago? It seemed like another life. And beside him, Daniel, always looking so serious, but as mischievous as his ginger hair suggested. She reached up and touched her own–more gold than red, but otherwise so much like her brother’s. One page of the book was bent. Beth smoothed out the rumple and the text caught her attention. The maidservant conducted her down the stairs and through the tall doorway of the dining room. Madam was already seated at the table to the right of a handsome, well-dressed dark-haired man. Clarissa’s breath caught in her throat. Quickly, she sought to regain her composure. The footman drew a chair from the table, opposite Madam, and waited. Clarissa approached and with each step she was surer. It was escapist, nonsense fiction. Nothing to do with real life. Beth returned the book to the shelf and grabbed her old comfort sweater from the sofa. She slid her arms into the loose sleeves, then pulled the front together to hold the softness closer. She’d like to see Maude. There was no employer to notify and her neighbor, Celeste, could get the mail. Why not drive to Preston and visit her? Beth pushed open the sliding door and stepped out onto her small balcony. She breathed deeply hoping fresh air would cool her brain. The parking lot below was almost empty. The spring-freshened breeze lightly masked the mingled odors of asphalt and stale exhaust. Beyond the parking lot and a buffer of cedar trees, most of the Route 50 traffic headed north and east, away from Fairfax and toward the DC environs. The world–the employed part–was en route to work. Her car sat idle a few rows back with the morning dew still clinging to the windshield. Only one person was in view, a man sitting in a shiny dark SUV. He was almost invisible behind its tinted windows. The side window was down and his large, muscled arm rested on the sill. The morning sun glinted on gold jewelry around his wrist and on his hand. He was a stranger and she was glad. She didn’t want nosy neighbors speculating why workaholic-no-time-for-gossiping, all-business Beth was home at this hour on a work day. The damp, metallic cold of the wrought iron railing reached through the nubby knit of her sleeves. Beth pressed her fingers to her face, to her throbbing temples. Her omissions were catching up with her. She’d never lied about her past, but she didn’t believe she owed anyone, including Stephen, her life story. She'd told him her parents died when she was young and that a local woman had raised her. That had satisfied him. He liked being free of family ties and emotional baggage. They both did. Romance and hearts and flowers had never been a part of their relationship, but then again, neither had regret or remorse. Until now. Yesterday’s shock had provided some kind of catharsis and opened her eyes. Their relationship‒once so sparkly‒had no more substance than a cheap trinket. But breaking up? He wasn’t going to make it easy. All the more reason to disappear for a few days. Beth went back inside and yanked the suitcase from the closet and opened it on the bed. She didn’t need to pack much. She wouldn’t be gone long–just long enough to hear Maude’s calm common sense advice. Her toiletries fit into specially-sized plastic bags and her clothing into packing cubes. Nice and neat. With a satisfied grunt, Beth closed the suitcase and carried it into the living room. Beth pictured Maude, thin with perfect posture and iron-colored curls tight to her scalp‒and with a wide smile when she opened the front door and saw Beth. The blinking red message light caught her eye again. Time to take care of it. She flexed her fingers and punched the blinking red light. Beth’s mind went blank. Mrs. Langhorne’s slow, southern lilt made ‘a few days ago’ sound like a question. The words hit her brain, but she couldn’t think. Mrs. Langhorne continued speaking. Beth slapped the Stop button. Something tore in her heart. With a trembling hand, she pressed Play again. Only Maude had her contact information. There was no love lost between Beth and the people she’d left behind in Preston ten years ago. In the years since, her trips to Preston had been brief and solely for the purpose of visiting Maude. The red light continued to blink, waiting, insisting she listen to the third message. She pushed the button. “Third message. Beth, this is Michael. Maude gave me your number awhile ago. You’ve probably heard by now, but I wanted to make sure you knew. It’s about Maude. She’s gone. If you’d like to talk, call me.” He left a phone number. One person from Preston had called, after all. His voice touched her in a way that the old photo hadn’t. Her eyes hurt. She waited for the tears to start. Expected them. Wanted them. Her eyes burned, but no tears fell. It was the effect of shock. Maude was gone. Employer was gone. Reality had suffered a sudden inversion. She closed her eyes and concentrated on breathing. This apartment in Fairfax was her present. The small town of Preston was her past. Look forward, Bethie, not back. But sometimes the past returned to claim its share of the present. She unplugged the coffee maker. She’d grab a cup on her way out of town. But she had to tell Stephen something. She couldn’t simply disappear. Beth practiced excuses and explanations as she made two trips down the stairs taking her suitcase and other items to the car. She tossed her suitcase onto the back seat and put her laptop bag on the floorboard, then stood in the open driver’s side door drumming her fingers on the car roof. It wasn’t his fault that, more and more, being around him made her feel trapped. Or, maybe it was partly his fault, but it was totally her fault she hadn’t done anything about it. She hit his number on the speed dial. A deep breath. “I’m sorry. I'll call you when I get back. We’ll talk then.” She disconnected. She backed out of the parking space, her foot powered by adrenalin, and almost ran over a man, probably the man she'd seen earlier in the SUV since no one else was around. Either she hadn’t noticed him crossing the nearly empty lot and or he’d moved quickly because, suddenly, he was there, his gray t-shirt filling her rearview mirror. He was unusually tall, and, thankfully, nimble. She was glad not to add manslaughter to her sins. Come hell or high water or from the frying pan into the fire–choose your cliché, pick your poison, Bethie–it all came down to the same thing. Next stop, Preston. But running away was tougher than expected. Stephen called before she reached Starbucks and again, as Beth settled back in the car with her coffee. She parked away from the store, around the side out of the eyes of passersby. She took a deep, cleansing breath, then dialed. He answered before the first ring ended. Muted voices rose and fell in the background. Office noises. “I’ll be fine.” She sniffled again and rummaged through her purse and glove compartment searching for a tissue. He was tuning up to run through the story of his investment failure all over again. She couldn’t deal with this. Wow! Has it been seven months already since we celebrated the debut of Beach Rental? Well, good news! 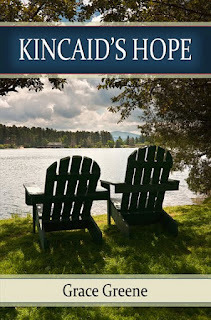 My good friend Grace Greene is back to share with us about her second novel, Kincaid’s Hope. Here is the blurb. Beth Kincaid left her hot temper and unhappy childhood behind and created a life in the city free from untidy emotionalism, but even a tidy life has danger, especially when it falls apart. In the midst of her personal disasters, Beth is called back to her hometown of Preston, a small town in southwestern Virginia, to settle her guardian’s estate. There, she runs smack into the mess she’d left behind a decade earlier: her alcoholic father, the long-ago sweetheart, Michael, and the poor opinion of almost everyone in town. As she sorts through her guardian’s possessions, Beth discovers that the woman who saved her and raised her had secrets, and the truths revealed begin to chip away at her self-imposed control. Michael is warmly attentive and Stephen, her ex-fiancé, follows her to Preston to win her back, but it is the man she doesn’t know who could forever end Beth’s chance to build a better, truer life. Grace, welcome back! Tell us about how it feels to be a published author. What are the highs and lows of this past year for you? Highs and lows? And everything in-between! I think I share this in common with many aspiring authors – the feeling that writing and publishing will be easier after we’ve passed the magical threshold of that first publication. Not true. Don’t misunderstand. It’s a wonderful feeling, but the next book still needs to be written and sold – and the potential for highs and lows is ever-present. Some people like the roller coaster; some don’t. For some of us, the next story just needs to be told and so we continue writing and seeking publication. The best ‘highs’ come from reader feedback. I love hearing from readers. They are amazing. I hit a new high a few days ago when I was notified that BEACH RENTAL is a finalist in the Gayle Wilson Award of Excellence contest. That's amazing, too! Congratulations! That's exciting. So how has this book been a different journey for you than Beach Rental? With BEACH RENTAL it was all new – everything was scary and everything was exciting. With KINCAID’S HOPE, the new worry was that readers who enjoyed BEACH RENTAL might be disappointed in my second book. So far, the feedback is wonderful! What message do you hope your readers come away with after reading Kincaid’s Hope? The themes in KINCAID’S HOPE are forgiveness and trust – forgiving oneself and others and trusting oneself and others. Forgiveness is a gift – one that we must accept for ourselves before we can give it to others. Without forgiveness we can’t move forward, but are forever trapped in our bitterness. If we learn to trust ourselves, we may find our biggest flaws can also be turned into our greatest strengths. What advice do you have for us starry-eyed literary wallflowers who are still waiting to be invited to dance? I advise flexibility. Many of us have/had a mental picture of what publishing should look like and it usually involved an agent, a brick and mortar publishing company and a prominent place on the display tables at Barnes and Noble. But the industry is changing so quickly that, without flexibility, authors, both new and seasoned, may find themselves forever waiting for The Call. The second piece of advice is to understand how much work you’re willing and able to take onto your own shoulders. Being flexible may mean you’ll consider less traditional modes of publishing, but be sure you have the time, skills and the will to do most of the work (both publishing and marketing) yourself. Excellent advice, Grace. Thank you so much for being with us this week, and for giving us a glimpse into the published side of writing. The deadline for entries is Saturday 10 PM eastern. Winner will be drawn at random and announced here Sunday.